What kind of event tourist are you? Some tourists make a point of seeing the sights. Others prefer to immerse themselves in the ambiance of a new country/culture. And some want nothing more than to switch off and relax in a place far from the trials and tribulations of work. The manic delight and amusement of the village elder who guided our car around the trucks that blocked the exit from the tiny hill-town of Monticchiello. 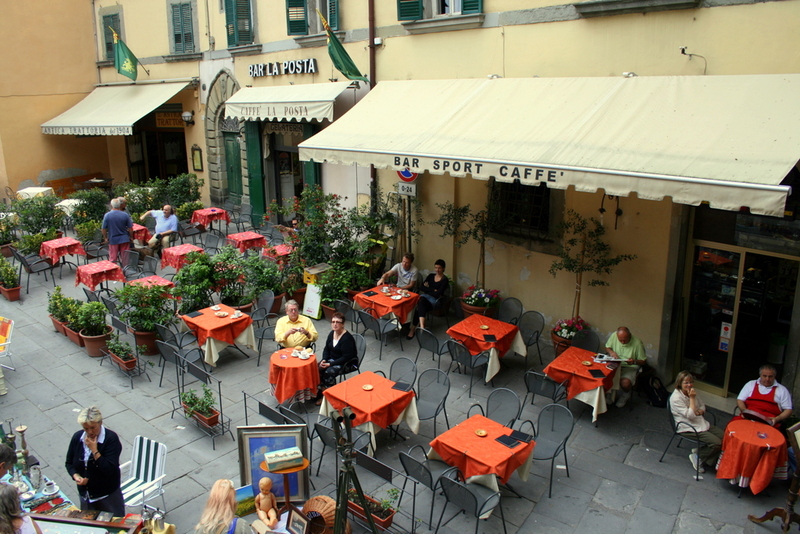 All the tiny Tuscan cafés we lazed in so we could hang out and watch Italians go by. The Lake Como fish-seller who took twenty minutes to successfully seduce me into buying the last of his fried calamari. Noticing some of the tens of thousands of little things—timings of traffic lights, scarves, houseplants, drinks, and climate—that shape and define a country’s culture. The young hotel receptionist, bless her, who sympathetically soothed us when we arrived exhausted after dragging our suitcases from the Zurich train station. A perfect day in the heart of the thousand-year old New Forest with our good friends Bruce and Elizabeth, at whose wedding my wife and I met. Event attendees are tourists too. Some event tourists are there for the content. They gravitate to the event’s museums and art galleries, concrete accomplishments of the far and recent past. They want to know the established order. Other event tourists are there for the connections. They are stimulated by the ambiance, excited by the opportunities of meeting new people, open to learn important things, little or big, from their peers. And some event tourists are there for a break from a job that may have become too much for them, that has exhausted them to the point where they need an official excuse to disappear from the office. And what kind of event tourists do you cater to at your events? This is the third of my blog posts written while vacationing in Anguilla. Anguilla is a country of 14,000 people and four supermarkets. I like Anguillan supermarkets. None of them are chains and each has its own character, which makes shopping interesting, rather than the typically predictable American experience. Nearly everything is imported. When we first started vacationing here, food arrived by ship once a week, usually making Thursday night peak shopping time. As the days passed, popular items like milk and vegetables vanished, only to reappear shortly after the container ships steamed into the harbor at Sandy Ground. Nowadays the shelves are stocked more regularly, but you still never quite know what you may find when you venture inside one of these idiosyncratic stores. Each store has different strengths and weaknesses. One boasts an extensive liquor department, but seems to have something against vegetables. Another is clearly aimed at retired colonialists, with a fine display of British brand name staples and household knickknacks, while everyday staples are shortchanged. And a third provides the best assortment of local foods, but little in the way of candy for the kids. What’s interesting is the evolution of these establishments over time. The older supermarkets used to have a monopoly on certain goods; if you wanted cream you had to go to Supermarket A, while Supermarket B was the sole supplier of Pampers. With more sources of supply, the possibilities have multiplied—and the stores have responded in very different ways. Six years ago, Supermarket C was the most haphazardly stocked of the three we patronized. Its marketing philosophy seemed to be we’ll take anything we can get out hands on, stack it in an aisle, and see if it sells. Their stock gyrated so widely from visit to visit that we avoided shopping there unless we felt like being truly surprised. Not surprisingly, it was rare to see more than a few cars in the parking lot. Meanwhile Supermarkets A & B relied on their exclusive arrangements to offer, between them, a fairly comprehensive, if somewhat unreliable, selection of useful food and household products. Fast forward to today. Supermarket C has been transformed. The premises are the same, but the shelves are now stocked with a comprehensive range of useful goods. And in addition, unlike competitors A & B, the store is open every day until late. As a result, it’s hard to find a space in the parking lot. Meanwhile, Supermarkets A & B have rested on their laurels. We don’t have to shop in both places to get what we want any more. C is now our go-to store. And yet, though their traffic is down, we still notice customers shopping at A & B. These days, those of us who don’t live on a small island know that failure to keep up with competitors in a commodity-driven retail market invariably leads to swift economic extinction. In Anguilla’s laid back environment, such change will probably occur more slowly, but eventually, unless they make significant changes, Supermarkets A & B will not survive. You’ve probably guessed how this relates to the future of conferences. 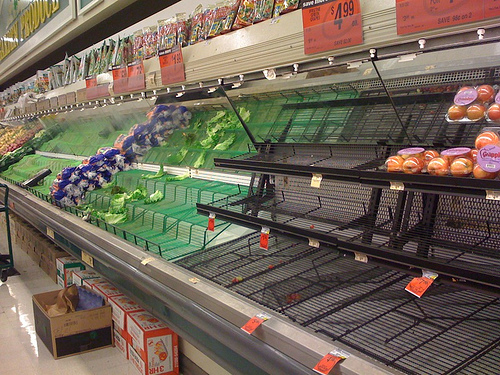 Think of Supermarkets A & B as set-in-their-ways organizers of traditional conferences. Think of C as progressive event planners who realize that people prefer to attend events that give them what they want rather than going to multiple events to get a piece here and a piece there. In Anguilla, people’s needs for supermarket goods didn’t change, but improvements in the supply of imported goods into Anguilla allowed Supermarket C to change what it offered to better match what people wanted. Likewise, people’s professional needs for relevant content, meaningful engagement and networking haven’t changed. But we now have a host of new ways to supply content outside the traditional conference, and a host of new ways to find out what conference attendees actually want to do while they’re together. Ignore them at your peril. See you in the aisles at Supermarket C! This is the second of my blog posts written while vacationing in Anguilla. This morning, the waves in front of Tropical Sunset at Shoal Bay East, Anguilla were just right. In the water I was hypnotized by the unceasing movement of my body, rising and falling as the blue water swells ran towards me. Their energy rushed at and around me over and over again, and I floated through them, buoyant. An unknown amount of time passed. Finally, I became aware that I was hungry. Lunch beckoned. When I turned back to shore, the waves, breaking on the white sand, crashed at my legs and sucked me back towards the sea, saying please, don’t go. Leaving a good conference is like leaving those waves. You don’t want to go. You don’t want to leave the friends you’ve made, the energy that you felt while you were together. The only consolation is that you’ll be back next year. This is the first of my blog posts written while vacationing in Anguilla. I’m in the middle of a three-week idyllic vacation in Anguilla, a tiny Caribbean island. Colonized by the British in the 17th century, Anguilla today is an internally self-governing overseas territory (Google it!) that still retains charming traces of its colonial past: driving on the left, Cadbury’s chocolate, the ubiquitous use of “Good morning”, etc. This is our fifth vacation in Anguilla. And besides some of the most beautiful beaches in the world (with almost no one on them), goats that ramble all over the place, excellent restaurants, and plentiful mango coladas, there are about 14,000 other reasons why we keep coming back. Just about everyone I’ve met who lives here has been friendly and engaging. Once in a while, all of us have a bad day, but Anguillans seem to stay upbeat regardless. There is a sense of acceptance of life’s realities here, and a tendency to look on the bright side of everyday trials and tribulations. Anguilla’s economy is almost totally dependent on tourism. So how locals respond and interact with tourists like me is critical to their livelihood. In my experience, Anguillans are uniformly pleasant without being obsequious. From my outsider’s point of view, they are running a 24/7 event which I’m attending. And they do it with style and an open heart, just being themselves. Event planners like me can learn a lot from them.